Question / Help Using 2 (or more) Logitech c920's or c930e's together successfully! I was having problems setting and retaining my settings while using multiple Logitech webcams with OBS. I have 2 Logitech c920's and 1 Logitech c930e (so far), and i could never get them all to work properly together at the same time so i combed the nets for a solution on multiple occasions. I will explain as well as i can, please don't expect any follow-ups if it does not work for you... Although i may check back from time to time. 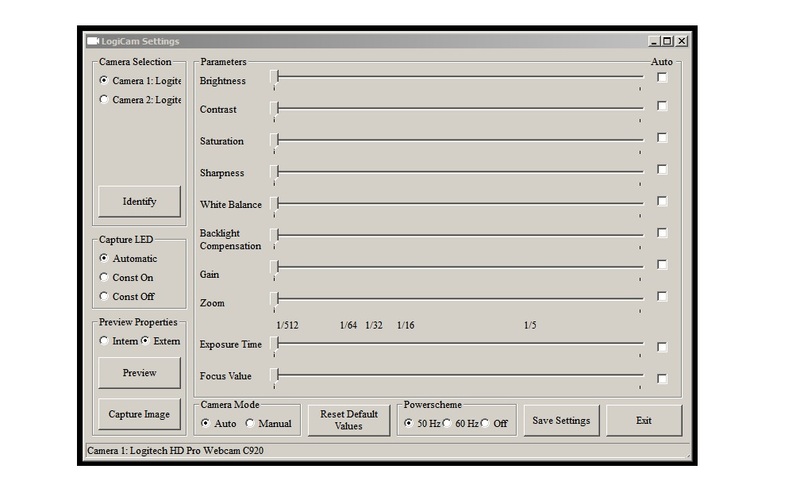 A user on that forum named MarkJeronimus wrote a program on the Java platform called AdvancedCameraSettings (ACS) to allow you to adjust and save the settings from two logitech cameras in a standalone pop-up interface. 0>Uninstall the Logitech default software, BUT LEAVE THE CAMERA DRIVERS INSTALLED. Java is a programming environment, Google it now if you are not familiar with it. I am on Windows 7pro and i installed the 32bit version of 8u40 even though i'm on a 64bit system, i don't think it matters though. On my first launch, the program seemed to crash Java and gave me an error message.. but i found that unplugging one of the cameras and launching the program worked, then i closed ACS again and plugged the 2nd camera back in and reopened ACS. Small hassle for me, but totally worth it anyway. The program shows you a list of attached cameras, I just chose my cameras from top to bottom, first camera listed is camera 1 for me. After you select the camera a list of codec's appears. If anyone understands this section more fully, any comments would be appreciated. Same drill as camera 1.. for me camera 2 is the 2nd camera on the list. 7>The interface will open and present LOTS of options for your camera, including a Load and Save function on the last tab. If you launch AdvancedCameraSettings before you launch OBS, the camera's output will appear in ACS's interface. What i do is launch OBS first and create a scene with both cameras in it and then launch ACS and just Load my favorite settings. That's about it... DONE. It may seem complicated at first, but if you have 2 c920's you probably understand. Really, i might use this to adjust settings even if i only had 1 camera because of the expanded options. I would recommend doing this when your computer is not likely to be changed around alot and pay attention to what usb socket each camera is plugged into.. Once you get something you really like and your set is not likely to change much you should screenshot all of your settings just in case. Okay, if you got all that working and STILL NEED MORE, i found that you can run more than one instance of MarkJeronimus' AdvancedWCameraSettings and control more camera(s) with a 2nd ACS interface. I mentioned earlier that you should put the folder containing the ACS program in a reliable place, now simply duplicate that folder and rename it accordingly. I renamed the actual program files accordingly, my first instance is for the c920's and i labeled it "c920 ACS" and dragged a shortcut to the desktop. My second instance, in the duplicated folder is for the single c930e and i labeled the program "c930e ACS" and dragged a shortcut to the desktop. Each folder has its own configuration file and the Loading and Saving function seems to work great so far. There are problems that persist using ACS that were also a problem with the original Logitech software (such as Gain levels jumping for no reason), but overall this little program completely destroys Logitech's default software. These Logitech cameras are really nice, but i was ready to give up and look for another model until i found ACS. I really appreciate MarkJeronimus for writing and sharing it in that forum. Really, really appreciate it. I am a complete novice with Java and the like so it took me a couple hours to figure it out, but with this list i think a novice could have this up and running in 20 minutes or so. I think the steps provided should work if you are running a similar system to mine... if not i really have no answers for you. Obviously, you need a computer that can process these CPU intensive camera's, so be aware. Worked for me. I realize this may be in the wrong forum, but i was too lazed to figure out how to post in the Guides forum.. Hope this ends up in the right place. Thanks, plot. I implemented and it works. I too have Win7 Pro, and used x86 (32-bit) without problem. QUESTION: What is little checkbox to right of sliders? Does SAVE remember each of two camera's settings, or just single setting? to the webcams from within OBS. You need to split the webcams up between your USB controllers or possibly buy a PCIE USB expansion card if you are experiencing lag/drop outs. Hey Doug: i believe the checkbox next to sliders indicates whether 'Auto setting' is on, where it will try and pick the best setting for you.. These sometimes turn off or on by themselves even in the default Logitech software. The Save function is per panel.. So you have to save and load for each camera. Unph4zed: i believe you got these working within OBS with no 3rd party, but i'm betting your reliability and control were frustrating at best. Can you detail your process for me? Reliability was fine because I used a PCIE expansion to ensure I didn't run the USB controllers short of bandwidth (1080p30). I had to set my levels (white balance, brightness, sharpness) manually after every restart but that took like 30 seconds. I can't really say I had any issues. Glad it works stock for you unph4zed, i need more reliability in the color, balance and etc. settings. It def takes more than 30 seconds to set up 4 cameras.. To get them perfect takes MUCH longer. I guess this post does not pertain to your setup, huh? I´ve installed the Java Developers Kit, downloaded MarkJeronimus and when I Plug the first camera it is recognized but the program doesn´t show any codec. What can be the problem? hey guy i have an issue when i tried to use it. \dsj.dll: Can't load IA 32-bit .dll on a AMD 64-bit platform, Make sure the dsj. You've probably figured this out by now.. but you need a 64 bit version of the directshow java wrapper library (dsj.dll). The guy who made the build only included 32 bits version. You can get a complete dsj developers kit including 64 bit dll from humatic.de. Im running 3x c525 and as unph4zed say i just threw away logitech drivers and voila! i can set all cameras separately. Yes there is a problem with reseting those settting after pc restart but its minor issue when you have all confgurations written on piece of paper. Even though the 2x C930 have the same and exact VID PID and BID, AdvancedCameraSettings detects all 3 of time. So far when I start it, it works. But once I choose one and click OK, I only see an empty column called FORMAT without any selections and can't skip this step. No matter which camera I select !?!? I tried Java 1.7, 1.8, 32 and 64 bits and even used the dsj files based on the bit version of Java ( Thanks MartiniGM )....but still doesn't work for me. Anybody had the same issue ? I wonder if it's because both C930 have the same VID, PID etc...can it be changed for one of them ? Same here ! Have you found the solution ?? I just register to write down my experience. I tried the method as OP described, but i got stuck like hellvice "Format column empty", so I found "ControlCam by Xpeace" it brings the possibility to control each cam independently. Isn't that an option in Logitech Webcam Properties? Isn't that an option in Logitech Webcam Properties? [/no, it has been controlled by the software, which is removed as per the instructions above. This sounds like something that you'll have to go to the Logitech support forums to figure out. ControlCam by Xpeace not for me, not for 4 cameras :( If you have only 1 or 2 - it's ok!